Made with natural essential oils that repel barnyard insects. No alcohol, solvents or industrial pesticides. Safe for use on horses and dogs. Do not use on cats. Keep out of reach of children. Shake well before each use. 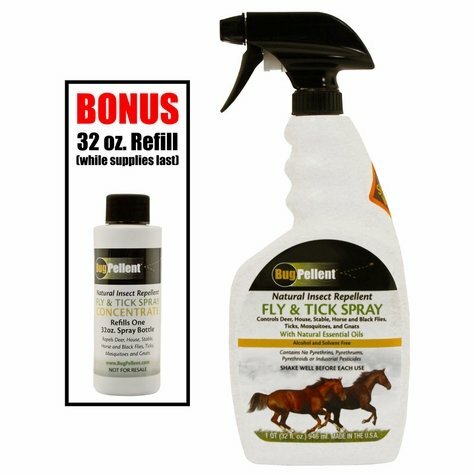 Turn spray trigger to select spray or stream. Spray directly on the animal or for wipe-on application spray on a sponge or dry cloth. For maximum effectiveness brush animal prior to application to remove dust and dirt. Application should include legs, belly, shoulders, back of neck and under chin. Avoid contact with eyes and mucous membranes. Do not use internally. For animals with skin sensitivity, test a small area and observe for 48 hours. Bio-Spot Flea Control for Toy / Small Dogs 5-14 lbs.